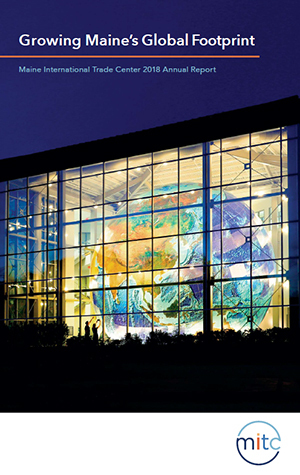 Maine International Trade Center (MITC) helps Maine businesses enter and expand global markets for their products and services. We offer one-on-one consulting and research, a trade education series, affordable group trade show participation, connections around the world, and export reimbursement funds for small businesses. MITC also works to promote Maine as an education and investment destination. A public-private partnership, MITC is funded through Maine Department of Economic and Community Development (DECD), corporate contributions, and membership dues of nearly 300 businesses and organizations. Our members include manufacturers and service providers, economic development and government agencies, educational institutions, and trade assistance organizations. We work with both exporters and importers. Learn more about what trade means to Maine and MITC activities in our most recent Annual Report.